I still remember the first time I saw George "Ginky" SanSouci practicing at Amsterdam Billiards. He was legendary for practicing the same shot for hours on end, and the first day I saw him was no different. I remember him setting up what seemed like a hundred variations of a simple little kick shot and, as a new player, I didn't get it. Why would a champion practice such a simple kick? It took me about 10 years to finally get it, but this little kick shot, when executed properly, can save you from certain death in many different situations, including ones in which you're not even snookered. Making a clean hit on this particular kick is very simple because the object ball is generally within three to five inches of the rail. Amateurs will have no problem making the hit, but better players want more than just a clean hit, they want to return safe, or even pocket a ball. What makes these types of kicks very special are the many different ways that you can execute the shot with a high degree of certainty. Now I realize that Ginky wasn't just trying to make the hit on the ball, he was trying to perfect his angles into the object ball. With a little practice, you too can master this useful little shot. The most common variety of this kick is when the player is snookered from the object ball as shown below. The path from the cue ball to the object ball doesn't require spin, and no balls are in the path of the one. 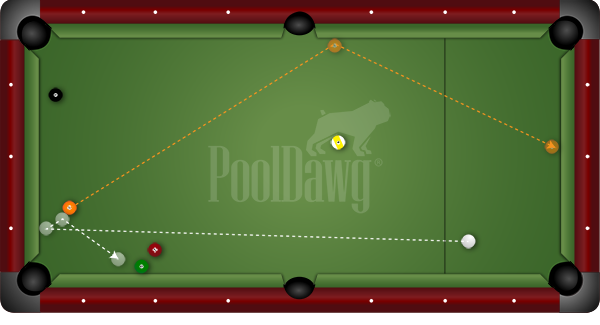 All that is required is a full hit on the one with follow, and the cue ball will park itself behind the seven ball while the one goes to the other side of the table. This same shot is still available even when there is a ball in the natural path of the object ball. If you hit the one the same way as the last shot, chances are good that the one will hit the two and you won't get the safety. The key to missing the two is that you have to create the angle that you need by using spin off the rail. 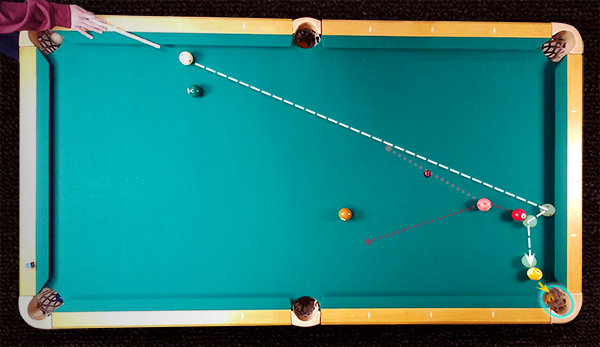 The amount of spin you use should open the angle of the cue ball enough to hit the one ball full on. 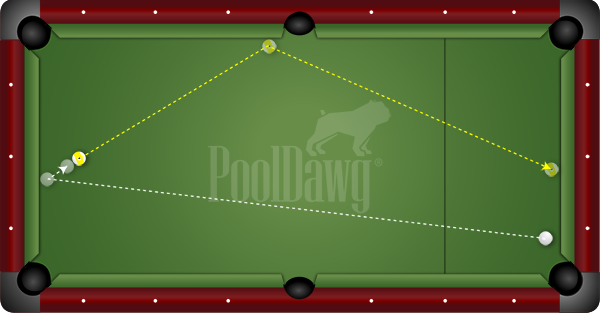 This will change the path of the one ball to avoid the two and go down table. The full hit on the one will also make the cue ball stop in its tracks. 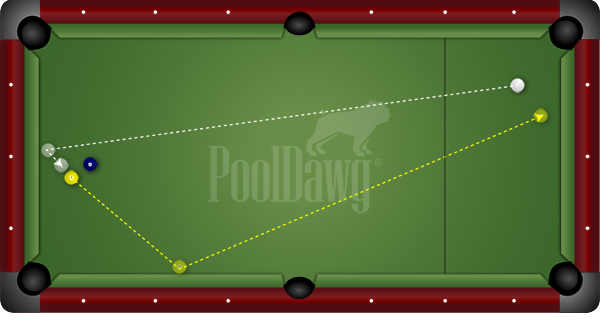 Another variation of this shot is hitting the side of the ball (instead of a full hit) to make the cue ball creep down behind other balls. 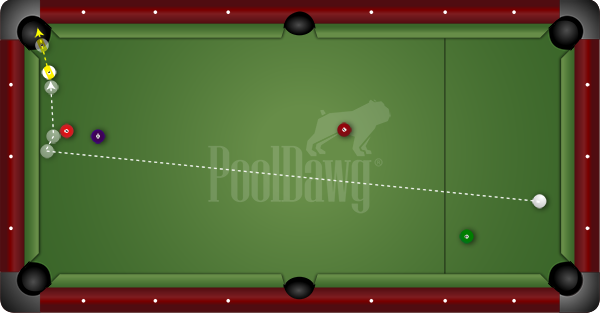 When the balls are laying as shown, which they frequently are at the beginning of the rack, aim to hit one half to three quarters of the five ball with follow. 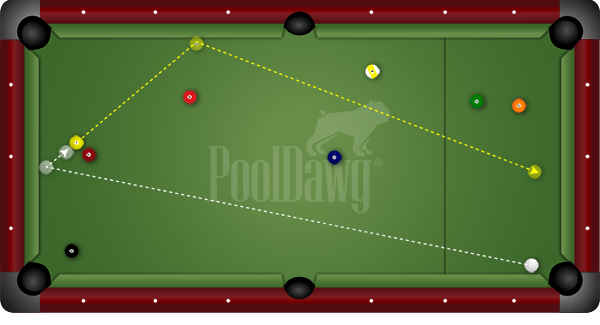 The five ball will move down table while the cue ball will slowly creep behind the balls close to the rail. Frank Says: "Ray "Cool Cat" Martin's got 99 Critical Shots in Pool and bank shot lessons are 1. If you like this article check out his book for 98 more critical shots like this to master!" Sometimes you can make a ball by hitting the other side of the object ball. By going past a full hit, the cue ball will carom off the back of the ball and make the ball that is close to the pocket. Running English will usually help your cause. One of my personal favorites is a great two way kick in the end game. We've all been in a situation where the cue ball and object ball are at opposite ends of the table. By kicking behind this ball, in 8, 9 or 10 ball, and making a full hit you will essentially trade places with your opponent. Don't forget to call the side pocket on this shot. You'd be surprised how often it goes in! All of the variations of this kick are used regularly at the highest level of the game. To most observers it looks like magic, but it's really just this little bit of knowledge and a bunch of practice!